Will Redmi Design The Cheapest Snapdragon 855 Phone? Recently, Xiaomi held its first conference in 2019 and issued an important statement. According to the latter, Redmi is an independent brand anymore. There were some intersections between the Redmi and Mi brands. So the manufacturer has decided to separate these two and develop each of them in its own way. In fact, this is a quite logical move. Many even say Xiaomi has come to this decision because Huawei’s Honor had started beating most of the Xiaomi cost-effective models. So it should do something to keep its positions. Currently, some of Honor models are using Huawei’s latest top-notch mobile platform, the Kirin 980. So if the abovementioned assumption has anything common with the reality, the Redmi brand should come with its own high-end model. Thus, there should be the Snapdragon 855-powered Redmi smartphone in the nearest future. Recently, Redmi’s general manager, Lu Weibing posted a photo on Weibo. 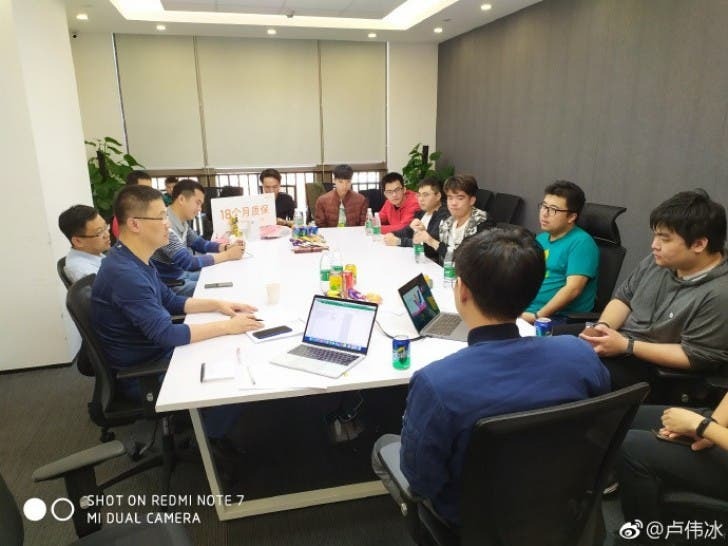 The photo shows a meeting the Redmi team is attending. He also added a caption to the photo, saying the team is discussing strategic development ideas of the brand. As earlier, Lu Weibing has announced they will be using Qualcomm’s best processor in the Redmi’s next-gen products, there is every reason to think, in the photo, they are also discussing the details of the Redmi smartphone packed with a Snapdragon 855. At least, many Mi users are thinking so. The first smartphone of this brand is the Redmi Note 7, which sports a 48MP camera, a hole-punch screen, and the full-blooded version of the Snapdragon 660. At the same time, it costs 999 yuan ($148). This was a real proof Redmi will continue to bring the price/performance ratio to the extreme. Also, Lei Jun said in an interview that the original Xiaomi brand phones may cost more in the future. Particularly, he said now Xiaomi can add a lot of new technologies to its smartphones, but as you guess, the cost will increase accordingly. Thus, the Xiaomi phones will no longer have a low price/performance ratio. In this sense, the task of making cost-effective models will be put on this new brand. So when the latter launches its representative smartphone packed with the Snapdragon 855, there is every reason to think it will be the cheapest model on the market.